Bollywood dance party in Houston!! With Houston's DJ Zee, NYC's DJ Masti and India's DJ Kamya. 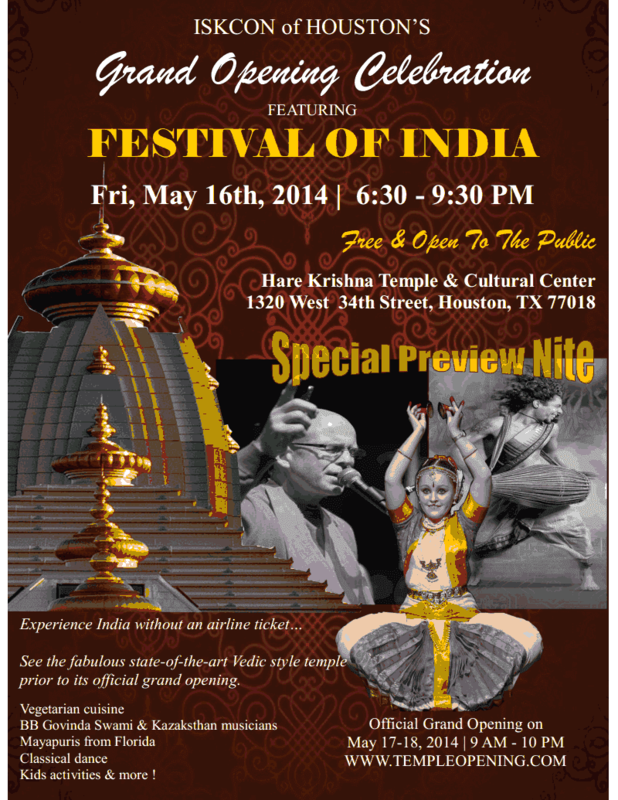 ISKCON of Houston will celebrate the grand opening of its new temple featuring Festival of India from Saturday May 17th through Sunday May 18th 2014. Special preview for *non-Indians* on Friday May 16th. This celebration marks the culmination of nearly forty years of dedication and hard work at ISKCON of Houston. 1320 W. 34St. Houston, 9am - 10pm. The festival is open to ALL. FREE vegetarian breakfast, lunch and dinner. Explore Indian music, arts and culture. For volunteering contact Rasikendra Das: 214-986-6171. The grand opening will feature a rare two-day appearance in Houston of the famous traveling Festival of India (FOI), FOI was a hit at the Houston International Festival in 2005 when it featured India. Under colorful tents you and your family will see illustrative art, sculpture, and photographic reproductions depicting aspects of ancient Indian culture such as bhakti yoga, vegetarianism, karma, reincarnation, ancient science, and Vedic histories. The festival stage will also host internationally renowned traditional and contemporary musicians such as BB Govinda Swami, Mayapuris, United Nations Association International Choir, as well as Indian classical concerts, children’s performances, kirtan, dance and drama. Gautama Buddha, the Shakya prince, became a world leader. Yashodhara, his wife, remains in the shadows. Yashodhara, a dance theatre production by JustUs Repertory, illuminates her plight—a single mother deserted by her husband. Grief impels Yashodhara to search for answers that she cannot find within the palace walls. Her inner evolution explores a poignant, powerful story of human loss, sorrow, and transcendence. Using Hindi, Pali, and English narration, this experimental, multi-genre production fuses the classical and contemporary to showcase the diversity of India’s living traditions and cultures. Sarpa Sutra (SerpentSpeak) brings together theatre, dance, and music in an allegorical revenge cycle that mirrors our lives and times. Urged by the fire god Agni, superhero Arjuna destroys the Khandava forest, destroying serpent king Takshaka’s wife and the entire kingdom. Takshaka in turn kills Arjuna’s grandson, Parikshit. In a colossal sacrifice, Parikshit’s grandson Janamejaya destroys the whole race of snakes. Throughout, serpent woman Jaratkaru urges her son Astika to stop the genocide. Can Astika save the planet? Be part of a unique cause - Farhan Akhtar Live in Concert on Sunday April 27th at 7pm, Arena Theater, Houston. 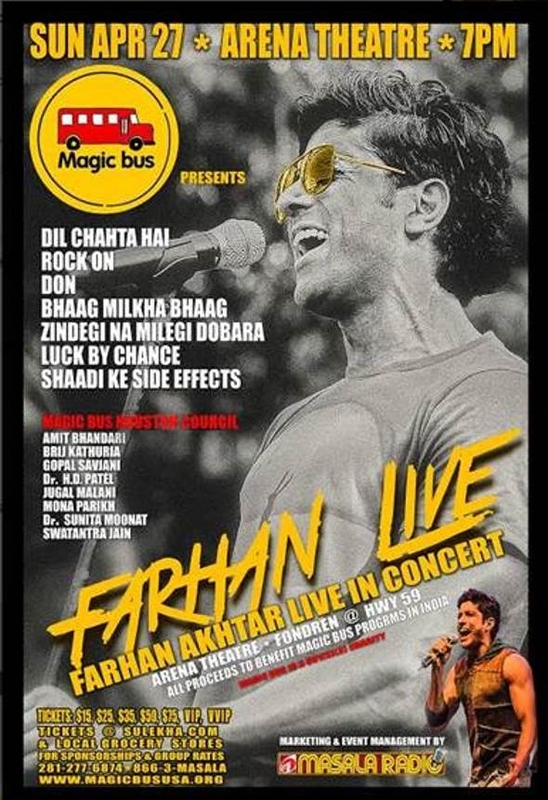 MAGIC BUS USA presents Farhan Akhtar Live in Concert on Sunday April 27th at 7pm, Arena Theater, Houston. All proceeds from the concert go to MAGIC BUS USA. MAGIC BUS USA – A 501 3(c) non-profit organization works with children in the slums of India to provide them an opportunity for a better life by bringing them out of the slums and providing a unique experience to a life outside the slums by engaging them in sports. (Learn more on Navrang **Saturday 4/26** about the event, the organization, the mission from Magic Bus USA's director Rahul). **CONCERT FOR A CAUSE** Tickets are only $15, $25, $50, $75, VIP, VVIP. Tickets are available at sulekha.com. BUY YOUR TICKETS TODAY!! Be part of a great cause!! If you cannot attend the concert please donate generously. Donations start at ONLY $25/year. Visit magicbususa.org for more information or click below. The authors will share their life experiences and information about the books on the Navrang Show 4/26. These are must read books - Own a copy and also gift it to your friends. Persian sufi mystic Rumi's deep philosophical poetry has influenced Indian's for centuries. His philosophy has been captured in ghazals, Bollywood film songs, and often recited by shayars. This is an exceptional opportunity to experience Rumi in Houston. On ktru's Navrang 4/19: Two Rumi enthusiasts will recite Rumi poetry in Farsi along with translations and discussion of Rumi's influence on music. At the Barn – 2201 Preston Street, Houston. Youth age group 10-17 years and adults of all age groups may audition for the play. Everybody is welcome!! You do not have to be of South Asian origin. Make the most of this opportunity!! Please email sara@shunyatheatre.org with preferred audition time. Wear comfortable clothing and be prepared for cold readings from the script. For more info about Shunya, please visit www.shunyatheatre.org.